Canyon Cabana was designed in 2005 by veteran houseboaters who operated the Misbehavin on Lake Powell from 1989 through 2004. The "Misbehavin Veterans" bring more than 75 seasons of Lake Powell boating experience to the design and operation of Canyon Cabana. We are dedicated to delivering superior comfort, style, functionality and ease of operations while cruising beautiful Lake Powell. 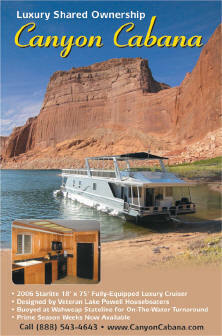 Click Here for a new VizzVox story by Michael Christiansen entitled Canyon Cabana Houseboating at Lake Powell. Enjoy!